Two days after the Palm Pre went on sale to take on the Apple iPhone 3G, Apple introduced a new phone and cut the price of its current phone. The new iPhone is called 3G S, Apple said today. 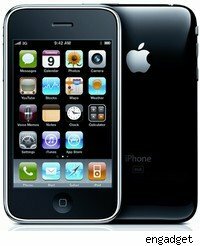 Apple (AAPL) dropped the price of the current 3G 8-gigabyte phone to $99 from $199 with an AT&T service contract. That's $100 less than the Palm (PALM) Pre. The new iPhone, which goes on sale June 19, will cost $199 for a 16-gigabyte version and $299 for a 32-gigabyte version. Added features include a three mega-pixel camera that allows users to record and edit video. The new phone also adds voice dialing and a compass. The other big Apple news: Steve Jobs did not appear at today's Apple event, as some had hoped or speculated. "Apple may have felt him coming out would have upstaged the product introductions." said Ryan Jacob, who manages the Jacob Internet Fund, which owns Apple shares. Jobs is scheduled to return to day-to-day management at the end of the month. Jacobs himself didn't upgrade from the 2007 version of the iPhone to the 3G last year because he was concerned about its battery life, which isn't a concern with the 3G S. "Two things are going to be compelling," he told DailyFinance in an interview. "The claims that it's over two times faster than the existing 3G iPhone and the second is the longer battery life." Investors were impressed by Apple's announcements at today's software developers conference as well. Apple shares spent the day lower, down as much as $5 a share at one point. After the news from Apple, the shares rallied and finished the day down 82 cents to $143.85. The shares are up almost 70 percent in 2009. The S in the name of the new iPhone 3G S, stands for speed, according to TUAW.com's recap of Apple senior vice president of marketing Philip Schiller's presentation today. Apple also started selling new MacBook Pro laptops today, and showed them off to the crowd at the conference in San Francisco today. The batteries in the Pro's last up to seven hours. Apple also introduced a 13-inch MacBook Pro that starts at $1,199 and cut the price of its thin MacBook Air laptop. Software is the focus at the conference and Apple took the opportunity to update its operating system, which will compete with Windows 7 from Microsoft (MSFT). Apple's Snow Leopard operating system will beat Windows 7 to stores by about a month when it is released in September.